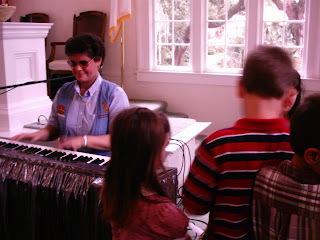 Here I am, sharing Music and Ministry with the children of Rockville Presbyterian Church, Wadmalaw Island, SC. Pastor Mark asked Miss Audrey, Zack, Ethel and me to join his Sunday School class, Prior to yesterday’s Worship. In addition to participating in an inspirational discussion of Colossians, we were given an opportunity to share more about the outreach and Children’s Chaplaincy that are such an important part of this Ministry. Talking about “my” kids, I thought of T, with whom I was blessed to work only the day before, and B, who I’m told placed fourth in her division of this year’s National Braille Challenge. It is such a joy to know these and the other young people whom God has placed in my life! So many reasons to celebrate Father’s Day, and give thanks to my “Heavenly Dad”!